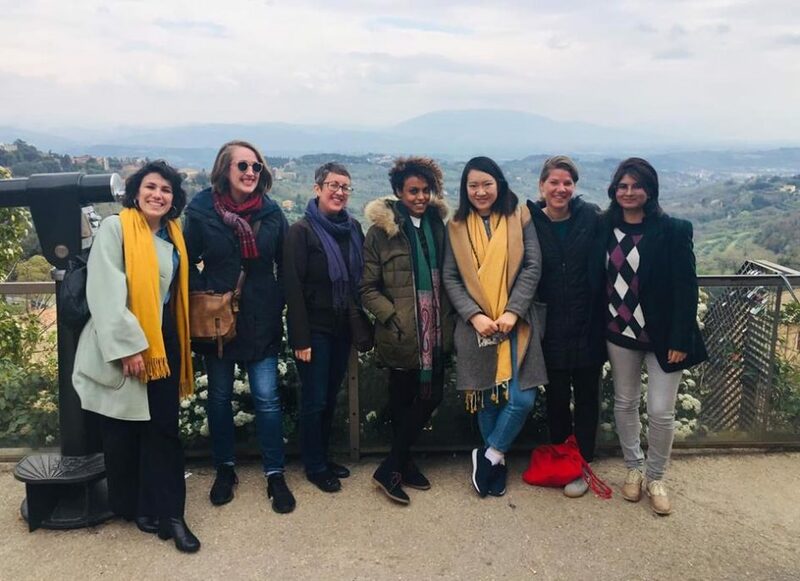 Last week, Hostwriter joined more than 600 speakers, guests and journalists from all over the world to converge in Perugia, Italy, for the annual International Journalism Festival. It was an exciting event, filled with great conversations and thought-provoking panels held in ornately-decorated auditoriums and chambers. 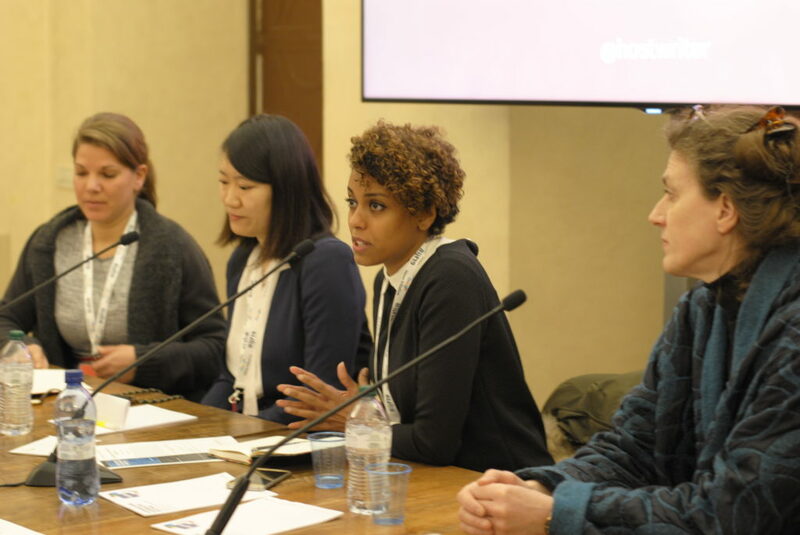 On Friday, Hostwriter hosted its own panel, “#UnbiasTheNews: How diversity can save quality journalism,” led by our CEO and co-founder, Tabea Grzeszyk. The other three panelists – Brigitte Alfter of Arena for Journalism in Europe, and our ambassadors Qian Sun and Wafaa Albadry – are also contributors to Hostwriter’s forthcoming book that the panel took its name from. The entire panel discussion was live-streamed and recorded and is available to watch on YouTube. We even had a surprise video message from our ambassador Priyanka Borpujari, who noted that white male reporters can travel anywhere and write about any topic, while female Indian reporters are only ever asked to comment on stories about women in India. A lively discussion followed the presentations by the panelists, covering issues such as who can afford to do unpaid internships required for some journalism positions and the idea that diversity is not just for the sake of political correctness, but because it results in better journalism. “How big tech is redefining journalism” – Key takeaway: After scraping 450 websites for info on recipients of grants through the Google Digital News Initiative, netzpolitik.org found that the majority of grant recipients were automation projects at traditional, commercial media in Western Europe. “How life in the newsroom is (or should be) changing” – Key takeaway: There needs to be a new role model for journalists. Zuzanna Ziomecka, editor of NewsMavens.com, says, “You’re not at your best when you don’t acknowledge struggles.” NO – we don’t have to be “tough” and “have balls” to do our job! “How organized crime groups plan long-term investments and infrastructure” – Key takeaway: Law enforcement can’t always be effective against organized crime, because they act domestically and within national jurisdiction. Investigative cross-border journalism isn’t restricted in this way and can be more effective against transnational networks. “Freedom after expression: censorship of the press and violence against journalists in India and Pakistan” – Key takeaway: Rana Ayyub told the story of her infiltration of Hindu far right movement posing as a Hindu nationalist – leading to exposure of people currently in power up to and including Modhi. And how her story was killed. She eventually self-published a book detailing the cover-up of an attempted genocide. “Pitfalls of overreacting to populism: the relationship between populism and the media” – Key takeaway: Populists tend to use journalists to spread their narratives and ultimately radicalizes mainstream opinions. Caterina Froio of the Centre for European Studies and Comparative Politics encourages journalists to challenge populists by asking them about issues they don’t feel so comfortable talking about – other than migration. “Information overload: how journalists can cope” – Key takeaway: You need to build your capacity to focus. Schedule time when you will do the work that’s important to you. Design your space to enable that focus. In addition to hosting and attending panels, we took the opportunity to meet up with several members and supporters over some fantastic food – especially pizza – and beverages in town. And we were pleased to introduce Hostwriter to many journalists (and future new members!) along the way. Videos of all the panels are available online through the International Journalism Festival website. The next festival is scheduled for 1-5 April 2020.